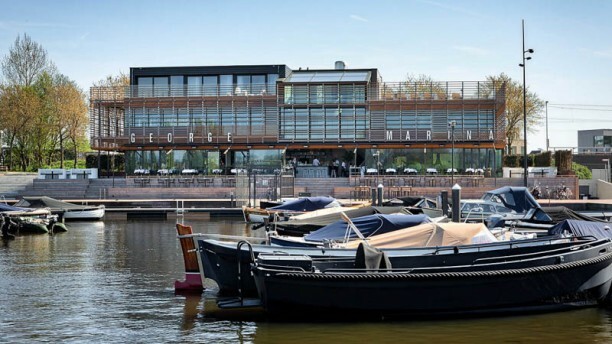 Check out this trendy restaurant on the Amstel where seafood and wine sway the scepter. An ideal place for fish, so close to the shore. The view is perfect for it and the ambiance is quite a bit classy. Oysters are every day available at this beach club, but also the usual classics dishes like eggs, a burger and onion soup are tastefully served here. In this beach tent in Amsterdam you’ll fancy for a brief moment a lively terrace on the French Riviera. We had a nice early dinner at New Year's eve. Everything went well and food was good. Especially the octopus and burrata. Absolutely great place with nice food and friendly service. Waiting time was just right, and overall atmosphere was great. Highly recommend. Te duur voor wat het was, vis was net top, hele kleine portie Black Cod. Great restaurant, great food, great ambiance and great service! Happy to have that restaurant in our neighbourhood! We had a nice diner in this very well located restaurant. Although it is not top-cuisine, the food is good and the service is nice. Lovely lunch, delicious, we highly recommend George Marina. It was my 3rd time on a super warm day and the whole staff were working really hard to accommodate us. It is such a nice location and I shall definitely go back. the food was very good but the blackened miso cod was not blackened and too expensive for cod. Ceviche and grilled lobster were excellant. We had a nice dinner with 7 friends last night. It was. A bit cold after the dinner and 4 of us we wanted to move inside for drinks. %70 of the restaurant was empty. So we picked up a table.. The waiter came towards us and ask if we had been seated. We mantioned that we had dinner outside and want to sit inside now. His manner was just talking to a teenager. First he got our order, then came back to tell it is not possible to sit hear as other will sit there. Also other who moved from outside to jnside. We had to leave. They did not even show any other table that we can sit. I really do not except such a manner form the service in a restaurant that you pay 60 euros plus. It is really a fabulous location and very nice atmosphere. But the service should be improved. Nobody stopped by our table for almost 45 minutes. Then we managed to order. But then the wrong dish was served. We were OK for this change, not to wait any longer. Then after 5 minutes the right order came. Since we already started eating the former, we did not bother to change. But the food was very good, I have to say. Only the service should be improved. Because it is really a nice place. It would be a pity. It was my first time at your restaurant as it was recommended to me. My over all experience was disappointing. From the time we sat done, we received no service till we actually called a waiter to our table, and the experience just continued to get worse as the evening progressed. other table who arrived after we did got served drinks and starters before we did. The reality is that I will probably never visit your restaurant again or recommend it to friend. Service was very disappointing, the girl seemed like she really didn't want to work. Also the food compared to the price was extremely out of proportion. All in all we did not enjoy. Understaffed but the waitresses are working hard. Disconnected and indifferent management. Beautiful setting on the wayer and architecture to match in a tastefully redeveloped part of this beautiful city. Expensive for what you get and on top of it a bad service. Food is fair, nothing impressive. Not a smile, quite condescending and ''customer always wrong'' attitude. It took them more than 3 hours to serve a 3 course meal for lunch. In a business area you would think they would be faster. Disappointing. Good food, nice staff and great atmosphere. Especially when the sun is out! Nice restaurant in a beautiful location. The food is bad, the service is bad as well, very arrogant and don’t know the basics of wine. Time to get the food was a bit too long and there were not so many people. They shoud improve in that area. Food is amazing and location is perfect.